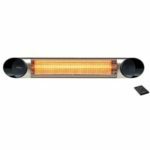 The space saving wall mounted outdoor heaters are perfect for use in the garden, garage, patio, terrace or even in your house! It’s space saving because unlike patio heaters that come with a stand and base, this can simply be fixed to a wall, therefore it won’t get in the way. 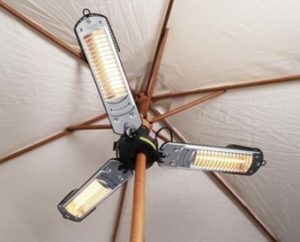 You can also buy a parasol patio heater which mounts onto an umbrella parasol or wall. Please be aware that not all of the outdoor wall heaters are waterproof, consequently it’ll need to be used under an awning for shelter or used indoors. 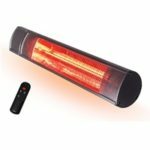 However, if you go for a waterproof outdoor heater then you can use it outdoors without worrying about the rain damaging it. 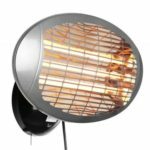 If you’re unsure whether a wall mounted outdoor heater is the most suitable for your garden then perhaps a standing patio heater might be a better option. Check out our comparison between the two if you’re 50/50 on which one to buy. 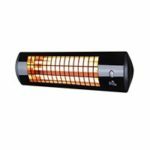 Before you decide on what one is the best wall mounted patio heater, there are several features you might need to pay attention to since this can influence what model you go for. Type – All types will be electric that’ll plug into the mains for power. Power output – Measured in Watts, a higher power output would mean the wall mounted heater is more powerful, thus producing more heat. There are several heat settings which you can select if you don’t want to use it on the maximum heat setting, it’ll also be cheaper to set it on a lower heat setting. Heated area – A rough indication of the area size heat will be provided to. 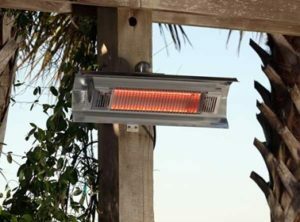 Indoor or outdoor – All of the wall mounted heaters are suitable for indoor or outdoor use. However, once you choose where to mount it to you can’t freely move it to a different location as it’ll be screwed to the wall. Waterproof – Having a waterproof outdoor heater is ideal for those who need the heater for outdoor use but don’t have an awning to place the heater under. Remote control – Enables you to control the settings of the wall heater by using the remote control, otherwise it’s usually operated by a pull cord or switch located on the heater itself. Cable length – The wall heater will have to plug into the mains as it’s operated by electric. Check the distance from where you plan to place the heater to the plug socket to determine whether you’ll need to use an extension lead or not. 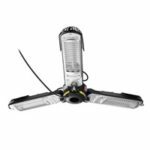 Wall mount screws included – Usually the screws and mounting kit will be supplied, except for the Firefly parasol patio heater you’ll need to purchase the wall bracket separately. For those who are undecided on what type of outdoor heater they want then we’ve done a comparison between a wall mounted and a free standing one. This comparison will tell you the pros and cons of each one, which will hopefully enable you to rule one out. Doesn’t take up any floor space since it’s mounted to the wall. Usually cheaper and more affordable. Pretty much all models can be used indoors or outdoors. Limited to only electric models. Not portable as it has to stay fixed to one location. More portable as it can be freely moved around. Options of choosing electric or gas powered heaters. Much more variety to choose from. Some models look very stylish. More expensive, especially gas heaters. Can be a potential hazard as it can get knocked over.